Shooting of Col. Robert Moodie, Montgomery’s Tavern, Toronto by Charles William Jefferys. (December 4, 1837). Continuing our look at ridiculous events in Canadian history, this week: The Battle of Montgomery’s Tavern (December 7, 1837). It was one of several skirmishes that occurred during the short-lived Upper Canada Rebellion. The events that took place helped to shape the future of Canadian governance and democracy. 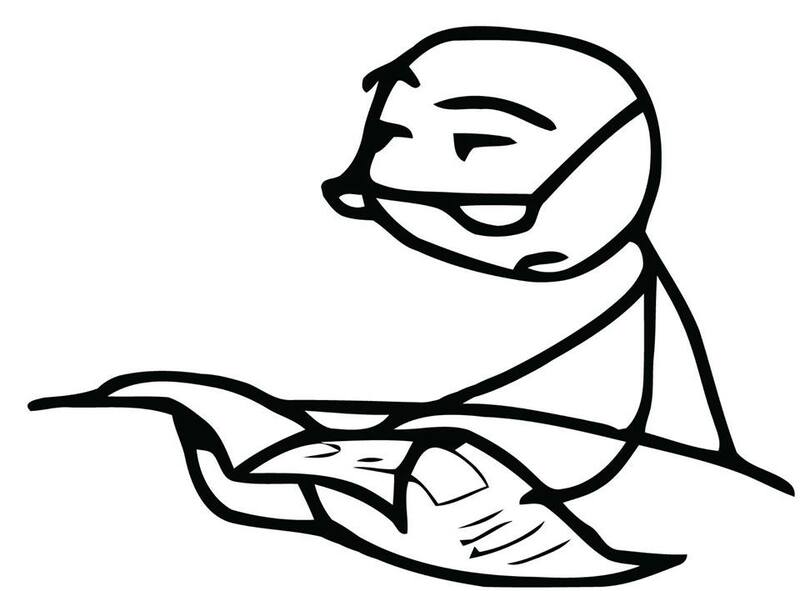 However, I say “skirmish” because “battle” is too generous a word. It would imply a sense of, you know, prolonged fighting between two opposing sides. “Hot mess” is probably the best way to describe what actually went down. From 1837-1838, both Upper and Lower Canada were in the midst of political turmoil. A long simmering reform movement dedicated to decentralizing political power and instituting responsible government in the place of tight-knit oligarchies finally boiled over in November 1837. (See: Family Compact and Château Clique). Hostilities broke out in Lower Canada first and this uprising ended up being the bloodier and longer lasting of the two. 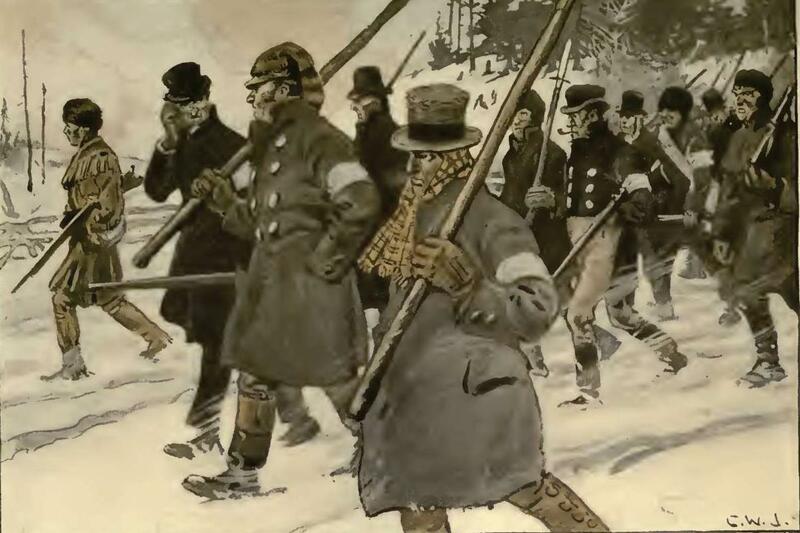 Inspired by their French neighbours, Anglophone rebel leaders such as William Lyon Mackenzie, Samuel Lount, and Peter Matthews began their own uprising. Mackenzie in particular was at the forefront of the Upper Canada Rebellion. A Scottish journalist who immigrated to Upper Canada in 1820, he published various newspapers over the years (the Colonial Advocate, Constitution, etc) which became the voice of the budding reform movement. Mackenzie tried to encourage public resistance towards the government and he went up against his political enemies in elections. Also, Mackenzie tried to spread the ideals of the American Revolution and even drafted our own Declaration of Independence in response to professional soldiers being sent into Lower Canada to deal with the uprising there. Lieutenant-Governor of Upper Canada Sir Francis Bond Head decided to have the troops that were garrisoned in Toronto dispatched to Lower Canada. When they left, Mackenzie and the rebels saw it as their chance to take over the city. Mackenzie picked Montgomery’s Tavern as their headquarters. Why? 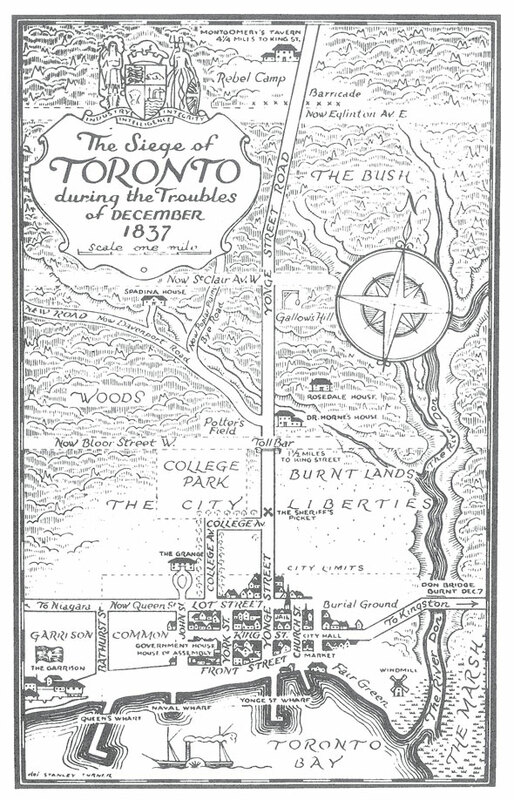 Its proximity to Toronto was advantageous to the rebels and the tavern had been used for a couple of meetings prior. The decision was much to the dismay of owner John Montgomery, who was sympathetic to the rebel cause, but not that sympathetic. On December 5th the rebels led by Anthony Van Egmond raided an armory. Colonel Robert Moodie, a British army officer, wanted to alert Lieutenant-Governor Head and attempted to lead a small band of loyalist volunteers through the crowd of rebels. He fired a shot into the air to clear a path and wound up getting shot in the head in response. The rebels kept marching south on Yonge Street. While marching south around 800 rebels encountered a group of 27 loyalist volunteers. Both sides were armed and both opened fire. Upon firing however, the rebels who were at the front dropped to the ground to reload. Those standing behind them mistakenly thought the entire front rank had been killed by the loyalists. The rebels did a collective “nope” and fled the scene. Two days later on December 7th, up to 1,000 additional loyalist volunteers from Hamilton arrived. Led by Colonel James FitzGibbon, the loyalists surrounded Montgomery’s Tavern and began firing heavy artillery at the building. Once again the rebels ran off. The volunteers then looted the tavern and burned the place to the ground. In total, between three to five men died. The end. Both the Upper and Lower Canada Rebellions were crushed. A number of the rebel leaders including Lount and Matthews were arrested for treason and executed. Van Egmond was also arrested, but he ended up dying from a combination of pneumonia and malnutrition. Montgomery escaped jail before he was supposed to be executed. He was later pardoned and came back to Toronto. Mackenzie managed to flee to Buffalo, New York, and hoped to spark an American invasion. He failed and did jail time for violating American neutrality. Afterwards, this guy actually had the balls to come back up here and somehow managed to get elected to the Parliament of Province of Canada (Upper and Lower Canada were united in 1841). He died in 1861 at the age of 66. Fun Fact: Future Prime Minister Sir John A. Macdonald was present during the Battle of Montgomery’s Tavern. He fought on the side of the loyalists. Despite my poking fun at the details of the battle and the overall failure of the uprisings, the events that took place were not in vain. First and foremost the uprisings were a definite factor in the unification of Upper and Lower Canada in 1840. Second, they were one of the factors behind the end of political oligarchies in Canada. In their place came the rise of responsible government, which shaped the future of Canadian democracy, (the executive branch is responsible to the legislative branch or in other words, the government is responsible to the people), was partially influenced by the ideals and events of the Rebellions of 1837. Fun Fact: Yes, William Lyon Mackenzie is related to Prime Minister William Lyon Mackenzie King. He was his grandfather. Frederick H. Armstrong and Ronald J. Stagg, “Mackenzie, William Lyon,” in Dictionary of Canadian Biography, vol. 9, University of Toronto/Université Laval, 2003–. Accessed from: http://www.biographi.ca/en/bio/mackenzie_william_lyon_9E.html. Wow. Well not every battle can be spectacular. I guess that’s why my teachers skipped over the Rebellions of 1837. From British loyalist to PM of Canada…that’s quite a jump. The most I ever heard about the Rebellions in a classroom surprisingly came from my American history professor in university. He wanted to demonstrate the widespread influence of the original Declaration of Independence and read out Mackenzie’s version as an example. Actually it’s not too much of a leap! Macdonald famously said, “A British subject I was born — a British subject I will die.” Loyalty to the empire was always important to him and was part of his nation-building endeavors (to starve off any possible attempts at annexation).